A writer who doesn’t read is like a musician who doesn’t listen. Beauty is a Verb promo poster. 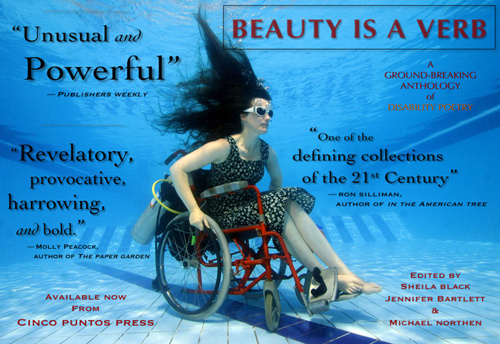 I’m reading a poetry anthology called Beauty is a Verb: the New Poetry of Disability, edited by Jennifer Bartlett, Shelia Black and Michael Northen and I want to literally devour it. I want to break its spine and tear its pages out, one by one, stuff them in my mouth and let the words feed me through my spinal column, into my brain. I want it to send shivers up my back from the inside, but for now, the outer part will have to do. Is that weird? Whatever, I don’t even care. Real talk: this book is good. Rant-about-it-on-your-blog good. And I’m only on page 123. When I read, I always have a pencil in hand. I like to underline, to write in the margins, dog-ear the pages. I like to exclaim in writing while I read so that later, when I go back to read it again after I’ve forgotten what I would have said at such-and-such page the first time, I can join my earlier self in loving a line all over again. It’s like community, but all by yourself. This book, I can’t do that. Because I haven’t found a page yet I didn’t need to dog-ear and well, that’s just shoddy referencing. Beauty is a two-faced god. Isn’t that so, so true? Wherever you fall on the spectrum of disability, that’s a line I think we can all get behind. Beauty betrays us all. If you’re, I don’t know, Adonis. Say Adonis. If you’re Adonis, you’re just a beautiful form. You’re just a shapely figure, and no one cares to find out any more. Beauty has betrayed you. If you’re, say, Quasimodo, all people see is your misshapen body, your otherness. They don’t want to know you, they’re repelled, repulsed. You’re just an ugly figure. Beauty has betrayed you, too. If you use a cane, a wheelchair, a guide dog, you are your assistance. They hold their own kind of beauty, a sort of fascination for those who can’t, or won’t, examine their elegant intricacies. But beauty betrays them, also. Don’t they steal the spotlight? Beauty betrays them, too. and I’m not a bomb to explode in your hands. How many of us take off our clothes with abandon? No matter what we hide under them, there’s always that moment of trepidation. Will he/she see me? Will they notice this scar here, that bulge there, the way my left buttcheek is just a little bit bigger than the other? The stakes are higher the more noticeable the deformity, unless it’s not. Unless you own your form, but even then. Even then, I think there’s always an infinitesimal moment when the world pauses and waits. Are you going to shatter under this new scrutiny? And if so, what then? Aren’t there always those things we all shy away from writing, because in the bright, cold, judgmental light of day, at high noon when it’s not hard to imagine that everyone is staring at us, something always retreats to that secret place behind your navel, underneath your heart where it can whisper and not even your brain can hear it? This anthology speaks to those secret things in me, the things I can’t say. It makes that quiet place shrink inside out, feeling exposed. Feeling raw and bare and sizzling in the sun. Perhaps you learned this as a child. First creeping up and down, as though each step was home, and the next step a strange land. I know this. But I couldn’t say it so well. Writing a review of a book I’m not even a third of the way through isn’t really my style. I’m generally more of a removed reader, but this is a gem, ladies and gents. I can say that much without reservation, already. So here it is: read this book. Whatever your mobility, whatever your concept of beautiful may be. It’s a keeper. Promise. Quick personal note: I’m so sunburned, I look like the lovechild of a rare steak and a cherry tomato. Which, with my hair color is quite a sight. And it’s march in upstate New York, so I’m not even going to pretend to be upset about it. Check back with me tomorrow when I can’t move, but for now? This is a good spring look for me. Next Make art, not war.